If you are looking for non toy Christmas gift ideas for kids, we have compiled a list of fun ideas sure to be a hit that will leave lasting memories and not add to the toy clutter at home. These ideas are packed with fun experiences and lasting memories. We are really trying to cut down on the amount of “stuff” and excess around the house which means I’m trying to come up with non toy Christmas gift ideas for kids this year. It seems the more stuff we have, the more stressed everyone is. It can be a vicious cycle. Budgeting to buy Christmas gifts for kids, figuring out where to put it and then another plan for getting rid of it! When we look back, the memories are really what will be cherished. The time spent playing with our kids with the new toy and not the toy will be remembered. These Non Toy Christmas Gifts for kids will encourage memories! Everyone will have an experience to create lasting memories and not another toy to add to the pile. I recently cleaned out the kiddos room and well I’m embarrassed to say we had multiples of the same toy. I’m not certain any of them have been played with past the first few minutes they received them. Something magical happened when I cleaned out their rooms. They suddenly wanted to play in their rooms because they could actually see what they had in their toy bins. Old toys became new again and they spent hours playing. It is amazing what getting rid of toy clutter and not bringing more in can do for everyone’s attitude. The great thing about non material gift ideas is it is truly the gift that keeps on giving. Instead of just a one time burst of excitement and a few minutes of playing with the toy, you are truly giving a lasting gift. Long after Christmas is over, they can cash in their memberships or gift certificates or whatever the case may be. They get a really fun experience and lots of amazing memories to cherish for years to come. Families may not have in their budget to do activities multiple times during the year. This is such a good way for Grandparents, other family members and friends to bless a family with fun things to do all year! You might want to save this list and give it to give family members for a few hints. 🙂 I’m all about lists and prefer when people give me some pointers so I am not aimlessly wandering around the stores. From non toy gifts for 1 year old and non toy gifts for 2 year old boy to tweens and teens, there is something for all ages on this list! A family membership to the zoo or museum will be a gift to last all year long. Another option if the annual pass isn’t in the budget is to give day passes. However, I would check the costs because often the annual passes for museums or the zoo can be a great bargain. Check Groupon for deals in your area. They often run specials. Surprise the family with a trip instead of a bunch of gifts. Great Wolf Lodge is just one idea and the kids will have a blast. I see really good deals on Groupon for Great Wolf Lodge every few months. It’s worth it to keep checking to see when they offer a sale. You can also save a ton from booking directly if you sign up for their emails. Does your child like dance, karate or other sports? 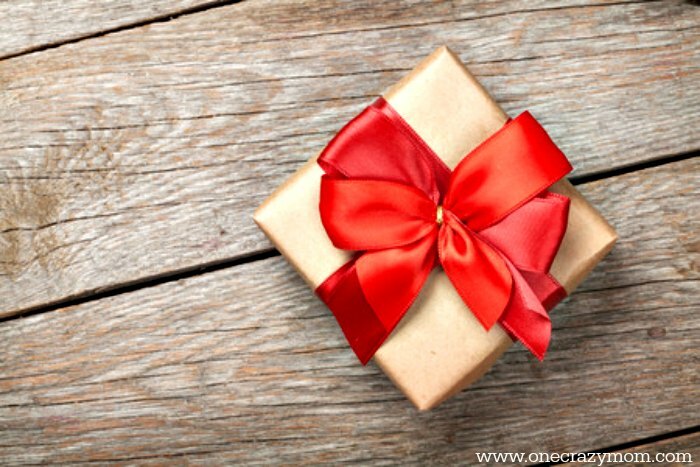 Give a class for a gift. Surprise them with an extra class or activity they have been wanting to take. Going out for ice cream is such a fun treat. Kids will love getting a gift card to their favorite ice cream place. If your family likes to bowl or skate, buy a few passes and wrap them up for Christmas. Everyone will have a blast doing this fun activity. Going to the movies can be pricey, so it’s a treat for many. Purchase a gift card to your local movie theater. It would be fun to wrap the gift card with a box of candy! My kids love looking thru photo albums. Make each child a photo album from the past year. They will feel so loved and special to have their very own book. Keep an eye out for Shutterly coupon codes. They often run sales during the year for free books and you only pay shipping. These are really nice books too. Kids love to experiment with things. Give them a science kit and the entire family can help. So fun! I have purchased several on Amazon and the kids have a blast. Make a coupon book full of things your child loves to do. A few ideas include: trip to the park, going to get pizza, family game night, making cookies and more! The key is to put things that your child loves and enjoys. They can “redeem” the coupons throughout the year. Wrap a gift certificate for manicures and pedicures and have a girl’s day. Make a personalized coffee mug for your child with their picture. They will think this is so cool. It will be perfect for hot chocolate or they could use it for a cereal “bowl”. Shutterfly offers these for free several times during the year. You only pay shipping and it works out to a great deal. Make it even more fun by putting a few hot chocolate packets and marshmallows with the mug! Celebrate all year long with passes to an amusement park near you. This is truly the gift that keeps on giving. If you have a big sports fan, surprise them with tickets to a game. They will love spending time with you while seeing their favorite team! Encourage reading by giving your kids new books to read. These also make great gifts for friends. Amazon sorts their books by age to make it easy to find what you are looking for. Fill a gift bag or box with craft supplies and the kids will be busy for days. They also make really cool craft kits that are reasonable on Amazon. This is such a good rainy day gift idea and will provide hours of fun. This is a practical gift that is also fun. Do a room makeover or get new bedding. Check out lots of fun decor ideas here. Give a family gift with something all the kids can enjoy. I bet they will be thrilled to get this. We bought one a few years back and getting them shipped to your house for free is the way to go. The kids will get to enjoy a swing set all year. They have many to choose from depending on the size of your yard and budget. Order online so you don’t have to figure out how to get it home. This might not seem exciting but my kids love having their own luggage! Packing for trips is much easier and the kids really get excited about packing and traveling. You can find reasonable sets and individual ones here. One idea is to give them new luggage and put a note on it saying that you are going on a trip! We have a fun Christmas tradition that everyone gets new pajamas on Christmas Eve to open. They can wear them that night! Amazon has some adorable pjs here. Encourage imaginative play and give dress up clothes to younger children. This will provide a lot of fun and allow their imagination to run wild. All kids love a fun sleeping bag. This is the perfect gift that is also so useful and a great idea for the kids. You can tell the kids you will have a fun family sleepover with their new sleeping bags. My kids loved the idea of a family sleepover. Give each child a piggy bank to encourage saving and good habits. Each holiday or birthday, you can contribute a little to the piggy bank for a practical gift. My kids absolutely love a gift card! It is a great way for the kids to get something they need or to use for a cool experience. Make a movie night themed basket and include a dvd and movie snacks. Depending on what your budget is, it would also be fun to add a soft blanket or even pajamas to the basket for a great gift. 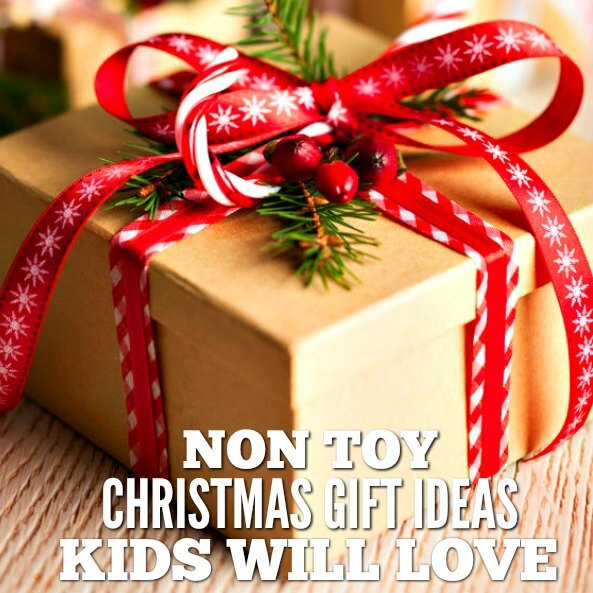 Hopefully this list of Non Toy Christmas gift Ideas for kids gave you some new ideas! Let us know if you have any ideas that you would like to share to add to the gift guide. These non toy gift ideas will provide so much fun! Some of these also would be neat stocking stuffers as well! If you are looking for gift ideas for toddlers who have everything and older kids too, this is the list to check out! Kids will love these ideas and have so much fun. We love non toy Christmas gift ideas for kids. They make the best Christmas gifts for kids! They don’t have more clutter to figure out what to do with and instead get lasting memories. 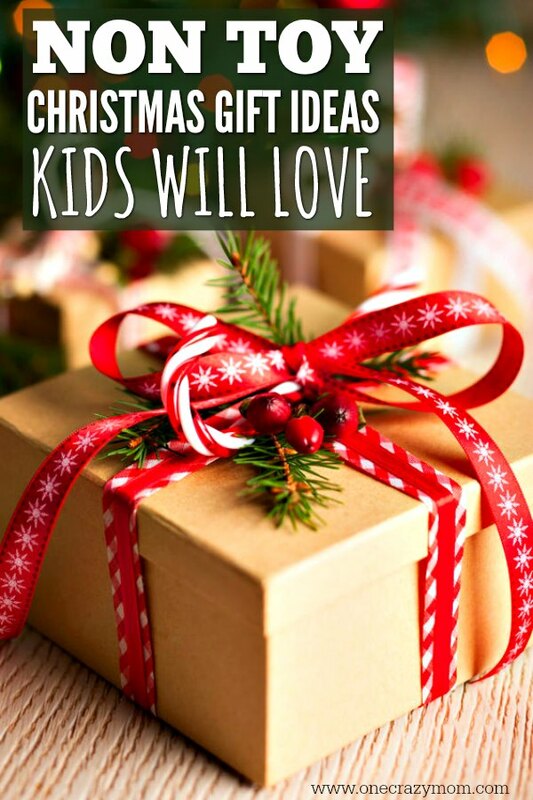 Each gift idea for kids is sure to be a hit with kids of all ages. These are also great first birthday gift ideas no toys options for the kids. We have started incorporating these ideas both at Christmas and at birthdays. It is so nice having fun things to do all year long. When family members and friends ask, I just tell them what we are doing. They are happy to oblige and eagerly jump on board. The kids have received all sorts of cool stuff over the years from tickets to day passes to classes and more! It is truly wonderful. They get to experience things they might not otherwise get to. We are always so thankful for everyone giving us such awesome experiences. Many of these alternative gifts for 2 year olds and non toy gifts for one year old, work for the entire family! I love ideas that work for little ones and older children plus parents have fun too! These ideas are economical, practical and sure to be a hit! Sometimes it can be hard making something work for a family with multiple children of various ages. Children’s museums, movies, theme parks and more can often work for lots of different ages. It is such a blessing to a family with multiples to find something that is age appropriate for everyone. I am sure whatever you decide to do, it will be a blast and the kids will love it. Come back and let us know what everyone thought and if they enjoyed their fun experiences. 6 Last Minute Christmas Gifts that will Know Their Socks Off!